STMicro and Ericsson announced their joint venture to develop communications chips for wireless market will be dissolved. This follows much market speculation as to what the companies would do as market share of their largest customer, phone manufacturer Nokia, has been declining against Apple and Samsung. The STMicro and Ericsson joint venture company was created in 2008 following on the acquisition of NXP wireless portfolio (creating the ST-NXP venture). However, the combined product mix and technology offering was not able to show a profit in the last 5 years. STMicro had a growing multimedia and connectivity solutions portfolio, as well as a complete 2G/EDGE platform and 3G offering. NXP had a stable product line of 2G, 2.5G, 3G, multimedia, connectivity and forward looking concept designs. Ericsson contributed its 3G and 3GPP Long Term Evolution (LTE) platform technology. As with any merger of this magnitude, and with the thousands of unique chips to consolidate under a new company, there were some trade-offs to be made in which devices would be kept and how the market would be approached. Unfortunately for many involved, the joint venture will now be dissolved and the technology split up between the two semiconductor parent companies, STMicro and Ericsson. This means Ericsson will most likely retain about 1,800 employees and STMicro about 900. However, the remaining 4,500 hundred people in the remainder of the mobile chip business will not have a place when the joint venture is shut down. STMicro and Ericsson had earlier sought a buyer for ST-Ericsson, but found no takers. STMicro said it expected $350 million-$450 million in cash costs from the shutdowns and restructuring, which is lower than the $500 million it predicted at the end-January. 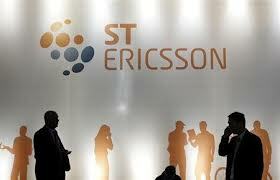 Ericsson said it had made a provision of 3.3 billion Swedish crowns ($515.74 million) in 2012 to pay for the moves. The Wall Street Journal had stated that from recent financial statements that the STMicro-Ericsson company had net loss of $749 Million. This was on top of the $1.53 Billion in dept forgiveness that the parent companies extended to the joint venture. It is unclear what will happen to the existing customers of this product line. It’s expected that the high volume devices will stay in production to support Nokia and other Tier-1 customers. Other products will most likely have a limited last-time-buy offer, which may leave many customers scrambling to redesign with new suppliers or to shut down those products.